I have survived the first week of a new semester of college. Though I did have to take a nap as soon as I got home each day. 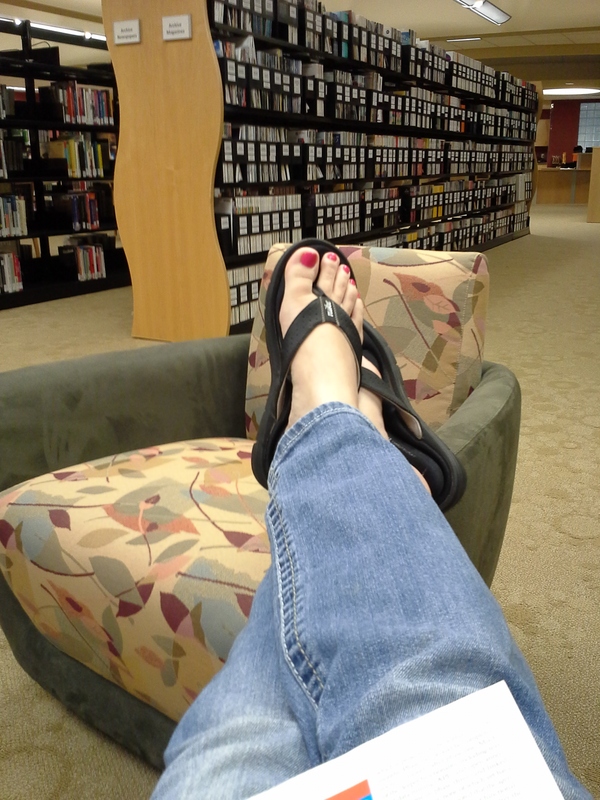 Today’s ‘View From Where I Sit’ is taken in the college library. I’m sitting in the magazine area, located in the far left corner as you walk in the door. I usually spend quite a bit of time in the library, in fact I’m in there every day. I find this little area by the magazines somewhat quieter. I’m wearing my favorite flip flops as you can see in the picture. It is a mere reminder that summer is over and school has begun. I’m taking five classes this semester, so I’m going to stay busy. This entry was posted in Blog, View From Where I'm Sitting and tagged Academic term, back to school, California, College and University, college student, end of summer, libraries, Library and Information Science, mom going to school, photography, single mom, single mom college student, single parent, student, summer, Two-Year College Libraries, United States, view from where I sit on August 26, 2013 by JenniferNAdams. 5 classes is a lot! Good luck! It is, but I’m trying to get done as quickly as I can lol!